It may sound counterintuitive, but scoring is what wins games. The Knicks have a solid defensive group, and Coach Fizdale has a knack for getting players to D up. What the Knicks lack, aside from experience and star power, is offensive firepower. There’s not much playmaking happening, at least thus far, for the Knicks as a whole. That’s where Allonzo Trier helps. Trier scored when he played at University of Arizona and has continued to score this preseason. Through three seasons at Arizona, Trier averaged 16.8 points per game and 15.8 PPG for the Knicks in four preseason games (per Basketball Reference and RealGM respectively). Allonzo can be the Knicks energizer off the bench. Guys like Tim Hardaway Jr. and Frank Ntilikina normally initiate the offense, whether they look to score or dish and Trier can do the same. Trier’s ability to score and create off the dribble forces the opposing teams defense to rotate. When Trier beats one guy, another defender ought to rotate over to Trier if they want to stop an easy bucket. It’s simple basketball: force the defense to commit and kick the ball to the open man. Lance Thomas can knock down open corner three’s with ease. Mario Hezonja and Courtney Lee can also knock in midrange and three point shots. Allonzo can give the Knicks higher percentage shot attempts after he puts in his 20 to 25 points. That can open up the floor and allow the Knicks to move the ball as defenses scramble to stop their attack. Allonzo Trier is a solid overall defender. Most rookies commit silly fouls, especially as they adjust to the NBA game and Trier has committed a few. With that said, Trier makes smart defensive rotations, has a knack for forcing turnovers and going for chase-down blocks. Trier will learn more as he plays more. Understanding how to guard the pick and roll is an aspect where he can improve. His one on one defense can also get better, but the important thing is Trier has the tools to defend better and is willing to learn. It’s hard to say how much of a boost the Knicks would get if they end up keeping Allonzo Trier. They’re currently a heavy underdog in the ultra-stacked Atlantic division. If for whatever reason the Knicks do pass on Trier, rest assured some team will pick him up. Athleticism and the ability to score consistently are money makers in this league. 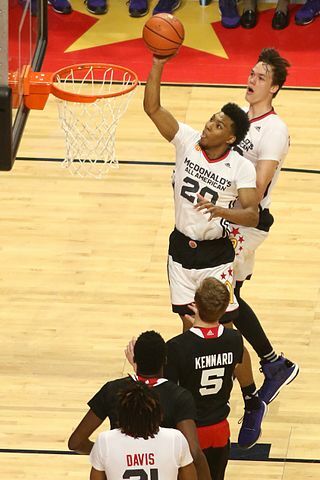 Allonzo Trier needs to keep his head up, continue to focus on improving his game and let his play do the rest. Making the NBA is no easy task and once you make it, you can’t take it for granted. Trier has been granted NBA level talent, now he has to make his NBA dream come true.